The poor potato. Its reputation has become tarnished by the devilish preparation known as french fries. Contrary to popular belief, potatoes are not naturally sliced into sticks and fried. Potatoes actually are nutritious. Side note: If you are in possession of a french fry producing bush, I'm sure a particular fast food restaurant would be most interested. 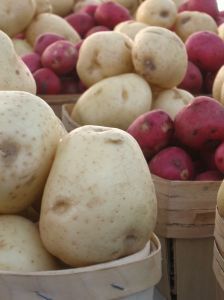 An average sized spud weighs in with around 100-120 calories. High in vitamin C, providing around 45% of your recomended daily amount. Inexpensive and versatile: It's a blank canvas for lunch or dinner. South of the border potato: tomatos, peppers, onion, tomatillo, cumin, cilantro, cilantro. Mediterranean potato: feta, tomatoes, marinated artichokes, basil, chopped olives. Middle Eastern potato: Greek yogurt mixed with chopped mint, falafel crumbles, eggplant. Pizza potato (okay, not really a region. ): tomato sauce, garlic, mozzarella, basil. Do you have a go-to spud set up? Let me know!